This paper presents a flexible microscaffold to facilitate the fabrication of different cellular constructs which could be used as the building units for the construction of a larger tissue with a complex structure. The device consists of a 6×6 array of membrane actuators, made of Polydimethylsiloxane. The superiority of membrane actuators helps preventing the leakage of culture medium and allows for the formation of various temporary scaffolds. In biological test, NIH3T3 cells were seeded on the scaffold provided. The positive pressure applied to membrane actuators enables the formation of the scaffold for construction of hole array-patterned and round flat cell sheets while the negative pressure applied enables the scaffold for construction of spherical cellular aggregates. The results after 2-day cultivation show that the micropatterned cell sheet has a thickness of about 100 μ m and a hole diameter of about 200 μ m. In addition, the round flat cell sheets have a diameter of about 623.87 μ m, and the spherical aggregates have a diameter of about 280 μ m. These suggest the possibility of using our device to prepare many different cellular constructs with more complex structures in future biological applications. The need of engineered organs in current clinical therapy has been widely recognized over the past decade. Although the transplantation of healthy donated organs may reduce the death toll of such patients, the reality is that not enough persons donate organs. To solve this issue, the replacement of damaged human organ with an engineered organ, prepared by tissue engineering approach, has been popularly addressed since mass production of these engineered organs would certainly help to meet the high demand of transplant organs. Due to the complexity of an engineered organ that could mimic functions of a human organ, the fabrication by means of direct assembly, like when manufacturing a car, has caught our attention. For example, an engineered kidney could be fabricated by assembling many engineered parts such as the ureter, capsule, cortex, and medulla. Thus, composite tissues with different structures are necessary. Generally, tissue engineering (TE) consists of 2 main approaches: cellular and acellular. Cellular approach employs small units of living cells for the construction of 3D tissues. This approach includes cell sheet stacking ,, cell sheet sandwiching , cell sheet wrapping ,, and 3D cell accumulation ,. Tube-like and 3D thick tissues are mostly fabricated by such methods. However, the fabrication of tissues with more complex structures, such as toroidal, lattice, and spherical shapes, is limited without the use of a support scaffold. In contrast, acellular approach generally employs biomaterials as a support to maintain the tissue structure during the cell fusion . The use of a pre-defined mold made of biocompatible material enables the fabrication of the toroidal –, lattice , and spherical shaped tissues . However, the fixed scaffolds used in current tissue fabrication methods inherently limit the variety of tissue structures fabricated. The preparation of many individual scaffolds would consume a lot of effort and time. Furthermore, the fabrication of polymer scaffolds generally requires a particular material with biodegradability as a support . In this work, we propose a device, which has ability to provide many temporary scaffolds, to facilitate the fabrication of tissues with different shapes. Cells temporarily employ the scaffold provided as a support until the strong cellular structure is created. These engineered tissues can subsequently be used as building units for the fabrication of a larger and more complicated engineered-organ, as shown in Figure 1. In this paper, the design and fabrication of the device will be explained. Furthermore, the applicability of this device in biological applications is shown by the fabrication of different cellular constructs, including micropatterned cell sheet, round flat cell sheets, and spherical aggregates. Conceptual framework of engineered organ fabrication. The device with a flexible scaffold is used to prepare many small building units which have different structures. Theses small units can be used to fabricate an engineered organ, i.e., engineered kidney. Our device consists of a 6×6 actuator array which provides many temporary scaffolds as needed. As shown in Figure 2, the actuator has a base diameter of 800 μ m, pitch of 1100 μ m, and a membrane thickness of 20 μ m. The device also has a microchannel layer which allows for the flow of working fluid to each corresponding actuator. The fluid-pressure applied to the inlet enables the deformation of a membrane actuator. Microscopic images showing the formation of a partial spherical actuator (a), surface contact between adjacent deformed actuators (b), and top view of a cup shaped actuator (c). (d) Schematic image of an actuator array with cup shapes. Compared to other actuator types , the superiority of the membrane actuator made of an elastic polymer, i.e., Polydimethylsiloxane (PDMS), makes it suitable for cell cultivation because there is no gap in the actuator layer. As a result, the membrane actuator can prevent the leakage of liquids such as culture medium. It provides a flat surface when it is not activated while it provides a partial-spherical shape when pressure is applied. When 2 adjacent actuators exhibit a large deformation, a surface contact between them is observed. 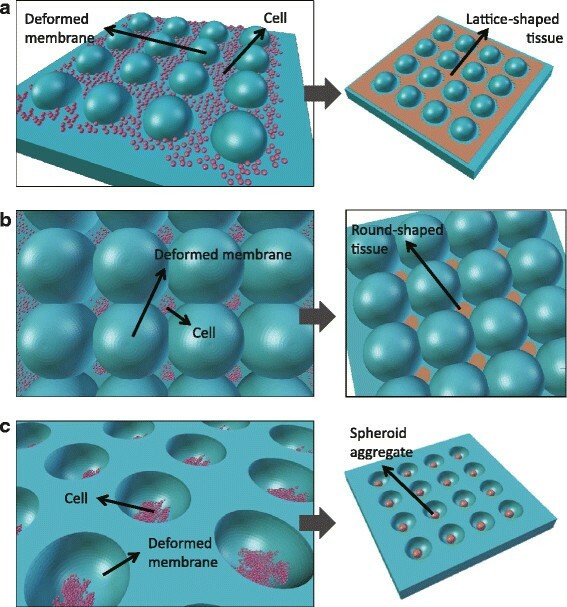 The surface contacts formed by many actuators subsequently enables the formation of an enclosed boundary which is useful for the construction of a tissue with cutout-shape . PDMS is used for the fabrication of our membrane actuator array due to its various benefits. Firstly, the biocompatibility of PDMS allows cells to grow on its surface ,,. Secondly, during the experiment, biological observation with a microscope is also possible due to its optical transparency. Moreover, the high elasticity of PDMS actuator enables the high actuator displacement ,. Thus, the higher vertical displacement enables thicker micropatterned tissue to be fabricated. The elasticity of a PDMS membrane actuator can also be altered as needed by varying the mixing ratio . The highly elasticity of PDMS makes the fully enclosed boundary provided by PDMS surface contacts possible. Furthermore, the nanolayer thickness of PDMS membrane can be prepared by the addition of an extra chemical such as hexane , or toluene . To form a temporary scaffold, it is inevitable that the membrane actuator exhibits a large deformation. Thus, high adhesion between PDMS membrane and the support mold is necessary. The use of plastic as a support mold is not applicable due to the low adhesion between PDMS and plastic. Due to the high adhesion between PDMS parts, we hence considered a device entirely made of PDMS. Moreover, the use of an adhesive layer for the bonding  can also promote the adhesion between PDMS parts. As an actuator, a very thin PDMS membrane is required, so that a small applied pressure can generate a large membrane deformation, without detaching the PDMS membrane from the PDMS support mold. Although the higher spin coating speed results in the thinner PDMS membrane, there is not much thickness difference when the spin speed exceeds 4000 rpm . For example, the spin of a mixed 10:1 (ratio of base to curing agent) PDMS at 4000 rpm for 60 s results in the membrane thickness of 20 μ m while the spin at 8000 rpm results in the thickness of 8 μ m. Furthermore, the wrinkle on PDMS membrane tends to occur easily on the thinner membrane than the thicker membrane, but the thicker membrane needs a higher applied pressure than the thinner one in order to achieve the same actuator displacement. Thus, we considered a thickness of about 20 μ m for our design. For the base diameter of membrane actuator, X. Arouette et al. suggested that the membrane part around the base of smaller diameter-actuator is subjected to more stretching than other parts. The highly stretch can cause damage or produce wrinkle on the membrane. If wrinkle occurs on the PDMS membrane, the membrane will not provide a flat surface again if it returns to the rest state. Moreover, during cell cultivation, the weight of culture medium can easily deform such damaged membrane and cause a rough surface on the actuator layer although actuators are in the rest state. The diameter of our actuator is 800 μ m since an actuator with smaller diameter has a higher chance to have wrinkle when it exhibits a large deformation. Furthermore higher applied pressure is necessary for a smaller diameter actuator to achieve a high displacement. In our design, an incompressible liquid, i.e., glycerin, is used as the working fluid since it helps preventing membrane deformation at rest state, due to the weight of culture medium. The device consists of 2 main parts: the actuator and microchannel layers. 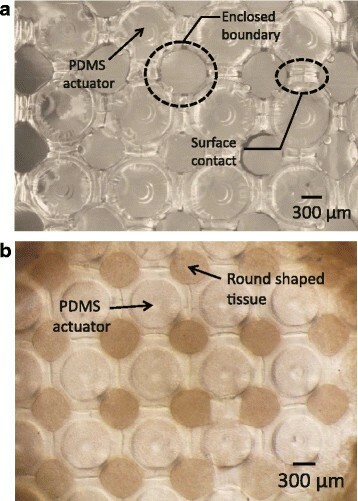 A microstructure made of Polymethylmethacrylate (PMMA) was used as a negative mold for the fabrication of a PDMS actuator layer. A plain PMMA was firstly micromachinned by Micro MC-2 (PMT Corporation, Japan) into a pattern with a 6×6 pin array (Figure 3(a)). Each pin has a diameter of 800 μ m, a height of 500 μ m, and a 1.1 mm pitch between adjacent pins. After micromachining, the PMMA was submerged in the Isopropyl Alcohol solution (Sigma-Aldrich Co., Japan) and shaken at 43 kHz for 15 min by an ultrasonic cleaner (ASU-3D, ASU Cleaner, AS ONE Co., Ltd., Japan) in order to remove residual surface dust. 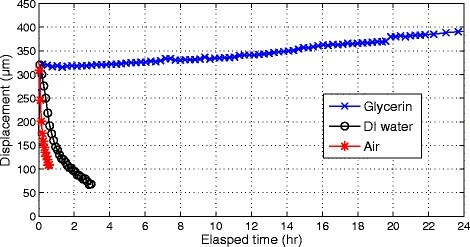 The PMMA microstructure was replicated by a 20:1 mixture of PDMS elastomer (Silpot 184, Dow Corning Toray, Co., Ltd., Japan) and curing agents (Silpot 184 CAT, Dow Corning Toray, Co., Ltd., Japan) (Figure 3(b)). After curing at 80°C for 20 min, replicated PDMS was gently peeled off micromachined PMMA. The holes with diameter of about 600-700 μ m were punched by a Biopsy punch (Harris Uni Core, Tip ID 750 μ m, Ted Pella, Inc.) based on observation through a microscope (SZX7, Olympus Co., Ltd., Japan) (Figure 3(c)). All punched holes have smaller diameters than the punch’s tip due to the high elasticity of PDMS. 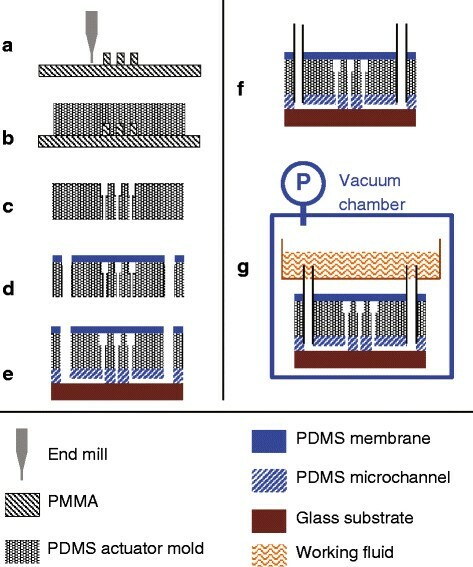 As shown in Figure 3(d), the top surface of PDMS actuator layer with hole array was then coated with an adhesive layer, a very thin layer of an uncured 30:1 PDMS mixture, and brought into contact with a 20 μ m-thick PDMS membrane. This PDMS membrane was previously prepared by spin coating (Mikasa Co., Ltd., Japan) a 30:1 PDMS mixture at 4000 rpm for 100 s on the plain PMMA, and subsequently cured at 80°C for 20 min. The assembled part including hole-array PDMS mold and PDMS membrane are cured at at 80°C for 20 min, and peeled off the plain PMMA. So, the fabricated PDMS actuator layer is shown in Figure 4(a). Fabrication process of our device. (a) Micromachinning of PMMA. (b) PDMS replication of PMMA microstructures. (c) Hole punching of replicated PDMS actuator layer. (d) Coating thin PDMS membrane on the actuator layer. (e) Assembling actuator and microchannel layer. (f) Insertion of microtubes. (g) Pouring of working fluid, i.e., glycerin. Snapshots during the fabrication process including membrane actuator array (a), microchannel layer before (b) and after hole punching (c), and assembled device (d). The preparation of PDMS microchannel or support mold is similar to that of PDMS actuator (Figure 3(a) and (b)). As shown in Figure 4(b) and 4(c), it has a channel width of 200 μ m and a depth of 200 μ m. It is made of a 20:1 PDMS mixture. To assemble the actuator and microchannel layers, the bottom surface of actuator layer and top surface of channel layer were exposed to plasma treatment using Plasma Ion Bombarder (PIB-10, Vacuum Device Inc.), and then brought into contact. The alignment of these 2 layers was done via the observation from microscope (Figure 3(e)). As shown in Figure 4(d), the silicone tubes were inserted to the inlet ports (Figure 3(f)), and connected to a reservoir of working fluid. The device and a reservoir were degassed in a vacuum chamber over night in order to replace the air trapped inside the cavity of the microchannel with the working fluid (Figure 3(g)). Finally, tubes were connected with a motorized syringe used to control the deformation of membrane actuators. Since cell fusion normally takes at least a day, a proper working fluids which maintains an actuator shape during the entire cultivation period is necessary. In our experiment, 3 different working fluids: air, DI water, and glycerin, were evaluated. The working fluid was firstly filled inside the cavity of the device. Then, it was pushed by a motorized syringe at a constant speed of 0.01 ml/min until the actuator reached a displacement of about 340 μ m. The motorized syringe was deactivated, and the change in the actuator displacement was observed over time. Before seeding cells on the device, the actuator layer was previously coated with the 2-methacryloyloxyethyl phosphorylcholine (MPC) in order to prevent cell adhesion on PDMS surface. For this preparation, the device was firstly exposed to UV light in the Bio Clean Bench overnight before coating with MPC polymer. Then, Lipidure®;-CM5206 (NOF Corporation, USA) was dissolved in ethanol (Wako Pure Chemical Industries, Ltd., Japan) at 0.5 wt%. The Lipidure®; solution was dropped on the actuator layer and spread consistently. Then, it was dried at room temperature for 2 hours. As a result, an adhesion reduction layer (MPC polymer) was coated on the surface of PDMS actuator layer. Then, the device was washed by Phosphate Buffer Saline (Wako Pure Chemical Industries, Ltd., Japan), submerged in Dulbecco’s modified Eagles’s Medium (Sigma-Aldrich Co., Japan) containing 10% Bovine Serum (Life Technologies™, Japan), and kept in a C O2 incubator, used in cell culture, for 3 hours. The mouse embryonic fibroblast cells (NIH3T3) were used for the biological experiments. The 150 μ l of culture medium containing 5×106 cells of NIH3T3, which were previously collected by centrifugation after trypsinization, were poured on the prepared scaffold. Three different cellular constructs, including micropatterned cell sheet, round flat cell sheet, and spherical aggregate, were fabricated by our device to demonstrate the applicability in biological applications. For the fabrication of micropatterned cell sheet (Figure 5(a)), positive pressure was slowly applied until actuators produced a small displacement without the formation of surface contact. To fabricate a round flat cell sheet (Figure 5(b)), a surface contact produced by 4 adjacent actuators was created. As a result, a fully enclosed boundary was created in the middle of these actuators. Seeded cells accumulated inside this cavity, and formed into an intact tissue sheet. Since this cavity enables the formation of a cutout shaped tissue, tissues with any shapes, such as T-shape, O-shape, and L-shape, are possible to fabricate by simply changing the pattern of deformed actuators. To produce a surface contact, actuators with a diameter of 800 μ m should have a displacement higher than 730 μ m, according the the experimental result shown in Figure 6(a). To illustrate the flexibility of our device, it can provide a structure of hole array enabling the formation of multiple spherical aggregates when negative pressure was applied. Seeded cells which accumulate inside holes will form into a spheroid after a period of cell cultivation. 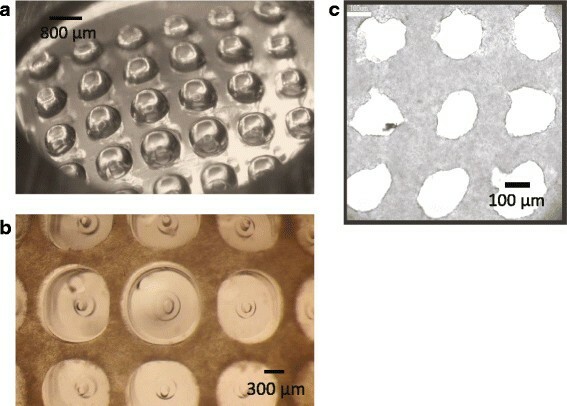 Conceptual fabrication of cell sheet with a pattern of hole array (a), round flat cell sheet (b), and multiple spherical aggregates (c) provided by a flexible scaffold. 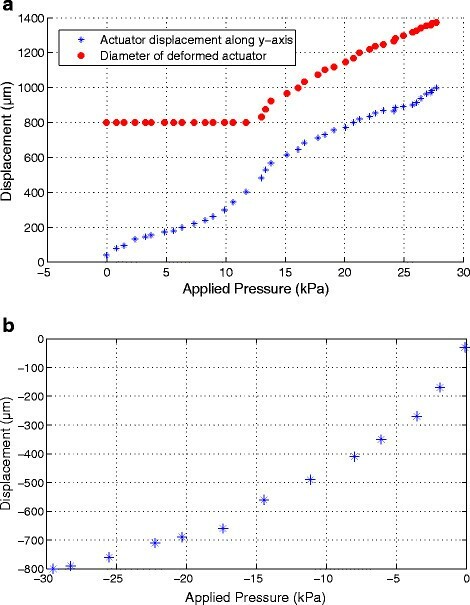 Graphs showing relation of applied positive pressure versus the geometry of partial spherical actuator (a), and relation of applied negative pressure versus the depth of cup shaped actuator (b). When positive pressure is applied to a membrane actuator, the actuator changes its shape from a round flat shape to a partial-spherical shape (Figure 2(a)). The base diameter which is 800 μ m in our design remains unchanged while the diameter of deformed actuator and actuator displacement keep increasing as a higher pressure is applied. As shown in Figure 6(a), the diameter of deformed actuator remains at 500 μ m before the applied pressure reaches over 12 kPa. When the actuator reaches a displacement along y-axis of about 730 μ m, the diameter of deformed actuator is about 1100 μ m. Then, the surface contact provided by adjacent actuators (Figure 2(b)) is observed. If adjacent actuators are activated to achieve a higher displacement, the fully enclosed boundary is possible to fabricate. In our experiment, a cavity in the middle of 4 adjacent actuators enables the formation of a round flat cell sheet. However, if surface contact is not formed, seeded cells will form an intact cell sheet with a hole array instead. On the other hand, when negative pressure is applied to a membrane actuator, a cup shape, enabling the construction of spherical cellular aggregate, is created (Figure 2(c) and 2(d)). A higher negative-displacement is obtained when a higher decompression is applied (Figure 6(b)). In our experiment, we provided the decompression of about 30 kPa, and it produced an actuator displacement of about 800 μ m.
Figure 7 shows variations in actuator displacement by different working fluids, including air, DI water, and glycerin. When air was used, actuator size decreased rapidly within about 20 min due to the air permeability of PDMS membrane ,. When DI water was used, actuator displacement was maintained above 300 μ m for 10 min. Then, actuator size decreased continuously due to the water-vapor permeability of PDMS membrane . However, it shows that the use of liquid as working fluid slightly improves the actuator stability. On the other hand, the actuator displacement remained higher than 340 μ m for more than 24 hours when glycerin, which has a much slower evaporation rate, was used. As a result, glycerin was selected for our application since the 24 hour-stability provided by glycerin is adequate for the construction of a functional tissue . Displacement variations of PDMS actuator over time with air, DI water, and glycerin used as working fluids. 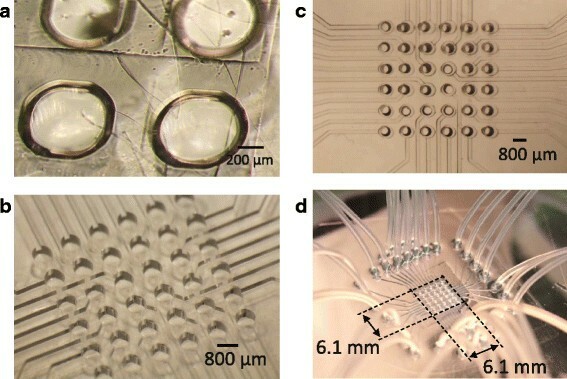 The scaffold for the construction of the micropatterned cell sheet is shown in Figure 8(a) where all actuators were activated to reach a displacement of about 600 μ m. Since the surface contact was not formed, cells formed into an intact cell sheet after 2 days, as shown in Figure 8(b). This cell sheet has a pattern of microhole array, and thickness of about 100 μ m. After recovering cell sheet from the scaffold, it shrank, and its hole size became 200 μ m while it was 300 μ m before recovery. Microscopic images showing a scaffold without a surface contact between actuators (a), the formation of a micropatterned cell sheet on the scaffold (b), and the micropatterned cell sheet recovered from the scaffold (c). Figure 9(a) shows multiple enclosed boundaries produced for the construction of multiple round flat cell sheets. Actuators were activated to reach a displacement of about 800 μ m and remained stable for 2 days. The highly stretching of 4 nearby actuators resulted in the formation of an enclosed boundary in the middle. Although actuator size slightly changed over time, the round shaped cavity were kept due to the high elasticity and adhesion of the membrane actuators. Since the actuator with bigger base diameter requires less applied pressure to achieve a high displacement, it is easy to remain the cavity shape over long time. After 2 day-cultivation, cells which aggregated in the cavity formed many round flat cell sheets. The formation of these cellular constructs were clearly observed, as shown in Figure 9(b). These constructs have an average diameter of about 623.87 μ m.
Microscopic images showing a scaffold with multiple enclosed boundaries (a), and the formation of round flat cell sheets on the scaffold (b). Decompression caused a membrane actuator to form a cup shape. Due to the MPC polymer coating, seeded cells did not adhere to the PMDS membrane and accumulated at the bottom of the deformed actuator. 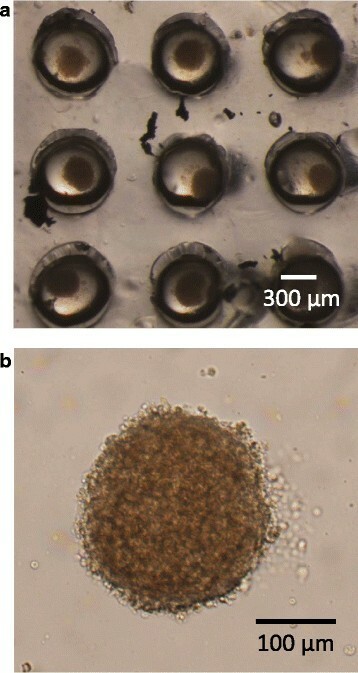 After 2 day-cultivation, cells formed a spherical aggregate, as shown in Figure 10(a). Furthermore, the array of membrane actuator array used in our design enables the simultaneous fabrication of multiple spherical aggregates. The spherical aggregates have an average diameter of about 280 μ m.
Microscopic images showing the formation of multiple spherical aggregates on the scaffold (a), and a spherical aggregate recovered from the scaffold. Although cells generally do not adhere to the PDMS membrane which is made of a 10:1 (ratio of base to the curing agent) PDMS , the adhesion between PDMS and cells changes when the hyperelastic PDMS membrane which has different mechanical properties is used . Thus, seeded cells will not form a 3D construct, and it will be difficult to recover the cellular construct from the scaffold. In our experiment, the prior coating of MPC polymer on the PDMS actuators helps preventing cells from adhering to them. As a result, the fabricated cellular construct can be harvested from the device, and the device can be reused for other experiments. Before the next use, the device should be washed by PBS, exposed to UV light in bio clean bench, coated with MPC polymer, washed with PBS, submerged in culture medium, and kept in the incubator for about 3 hours. In this paper, the utility of our device was confirmed by the successful fabrication of different cellular constructs. Instead of using many different fixed scaffolds, our device containing a flexible microscaffold facilitate the task by offering many different scaffolds based on the actuation patterns. The formation of cellular constructs was clearly observed via a microscope after 2 day-cultivation. The advantage of using our device is illustrated in the fabrication of an intact cell sheet with a pattern of hole array. Furthermore the construction of round flat cell sheet suggests the superiority of using highly elastic, adhesive membrane as an actuator. Due to the coating of MPC polymer, cells aggregated and form 3D cellular constructs. Furthermore, without this coating, the recovery of fabricated cellular constructs would not be possible. In our experiment, cells always remained their spherical shapes while they were forming their cellular interaction with each other. Furthermore, due to the formation of cup shape mold, cells accumulate in 3D and form into a spheroid . This experiment suggests the utility of our device in the preparation of different cellular constructs which could be used as building units for the construction of larger tissue with complex structures by means of part assembly, as shown in Figure 1. We have developed a device containing a flexible microscaffold enabling the construction of different cellular constructs in order to facilitate the fabrication of different cellular constructs. The actuator layer consists of a 6×6 membrane actuator array. It can form a scaffold enabling the construction of cell sheets with a pattern of hole array and round flat shape. 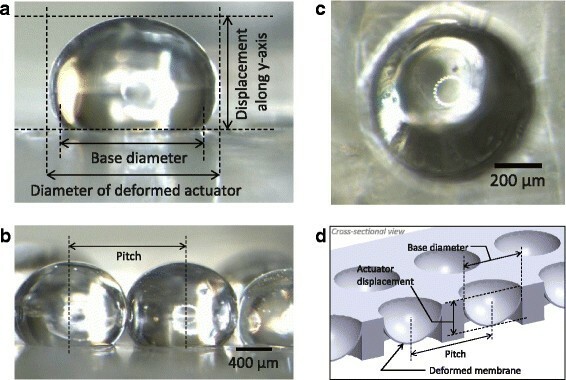 Moreover, it can form multiple cup-shaped scaffolds for simultaneous fabrication of multiple 3D cellular spheroids. In the future work, the construction of more complicated tissue shapes, i.e., T-shape and O-shape, will be included in order to show the variety applications of this device in tissue engineering. Moreover, the assembling of small building units for the construction of a larger tissue will be considered. This work was supported in part by Grant-in-Aid for Scientific Research on Innovative Areas "Bio Assembler" (23106005), and by "Nanotechnology Platform Project (Nanotechnology Open Facilities in Osaka University)" from the Ministry of Education, Culture, Sports, Science and Technology of Japan [F-13-OS-0005, S-13-OS-0004]. CP initiated the concept, carried out the design and fabrication of the device, conducted the biological experiments, gathered and analyzed data, and drafted the manuscript. KM helped to initiate the concept, participated in the device design and biological experiments, provided facility and technical support, and helped to revise the manuscript. HM participated in the design and fabrication of the device, provided facility and technical support, and helped to revise the manuscript. OK, KK, MY, AY, and YM participated in the design and fabrication of the device, gave technical advises, and helped to revise the manuscript. AT helped to initiate the concept, participated in the device design, provided all support and advises, and helped to revise the manuscript. All authors read and approved the final manuscript.